AstroSage Magazine: Mercury transiting In Capricorn - Know how it would be for you! 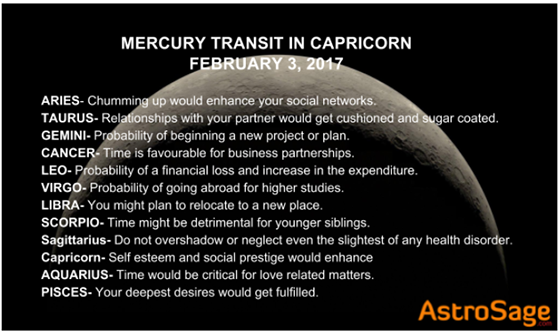 Mercury transiting In Capricorn - Know how it would be for you! The planet of intellect and communicative prowess, Mercury will be transiting in the Capricorn zodiac on 3rd of February. The planet boasts of imbuing us with quick logics and reasoning. Due to the influence of this planet, you act quick on your feet and depend mostly on your wisdom. With the movement of planet in your 10th house, benefits will ring in form all the directions and you’ll move heaven and earth to cash in all the benefits of your previous toils. To know how your love life would be in this Mercury Transit, Read More. The planet Mercury would move into your 9th house, symbolising good times for socialising. Students will be glad to see a steep rise in their determination. Familial life will be great, despite of some tiffs, to rectify this, Read More. Move into 8th house. Health down. Will find interest in Spirituality and occultism. Will work on some new shore. Keep a tap on your tongue, avoid arguments. Will experience lack of happiness/peace/contentment at home. Unexpected gains in terms of money and will receive some good news through communication channel. Read More. The transit of Mercury in the 7th house from your moon sign would bring in expenses for you. Partner would be supportive and make you feel loved throughout the period. To know about this in detail, Read More. The planet of intellect would move into the 6th house from moon sign. Financially, you might have to take special precautions. Rivals will be in for a treat, as you’ll outshine them. To know about the aftermath of this transit in detail, Read More. The 5th house from your moon sign will be graced by the presence of Mercury. This would make you more determined towards work and you’ll outshine others at work. To know about the love horoscope, Read More. The planet would move towards your 4th house, harbingering good news from around the world for you. You’ll be much interested in exploring the wilderness and have an eye for beauty in details. Home might undergo some changes. To know about them Read More. Transit of Mercury into the 3rd house from moon sign, would see a steep rise in your energy levels. You’ll be quick on your feet and act wisely. Siblings might have to face some serious issues, which would aggravate your stress levels, read more to know the aftermath of this transit. Read More. The planet of wisdom would move into the 2nd house from your moon sign. This movement would bring in a little harshness in your tone. You might get slightly fickle minded and turn a blind eye towards your peers. Spouse will demand more attention from you, but might remain distracted, to rectify this situation, Read More. The movement of mercury in your ascendant will help you gain popularity amongst the masses. You’ll befriend new people and make good use of your time by socialising. Support from elderlies will benefit you, but little glitches could make you terse, know more about them, here. Read More. The period of the transit would lure you towards spirituality. A great time for students, who’ve been aiming for higher education overseas. The potion of your love might just dwindle, Read more to rectify it. Read More. As the planet moves into the 11th house from your moon sign, you’ll gain a lot of ardor and wit. This period will see you in a brighter light, as you’ll keep yourself socially active and maintain cordial relations with everyone. Despite of a great time with family and friends, you might have to suffer from some drawback, know about them here. Read More. We at AstroSage, wish you the best in this period. May you fare well and achieve great heights.